Samsung and LG are known for their electronics and hi-tech appliances. 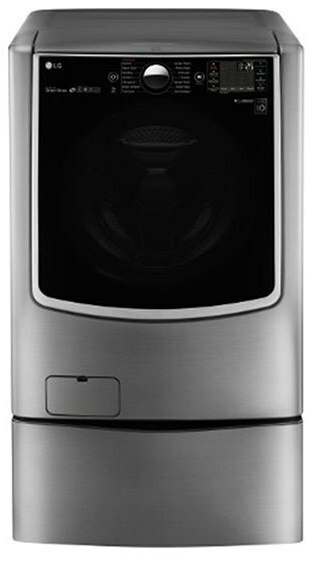 Today, we will be looking at the Samsung 2-in-1 full-Size washer vs. the LG Sidekick Pedestal washer. 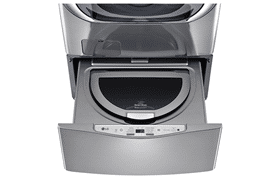 First off, what are the Samsung 2-in-1 washer and LG Sidekick Pedestal washer? Great question. To put it in the simplest terms, both are washers with added washing compartments. 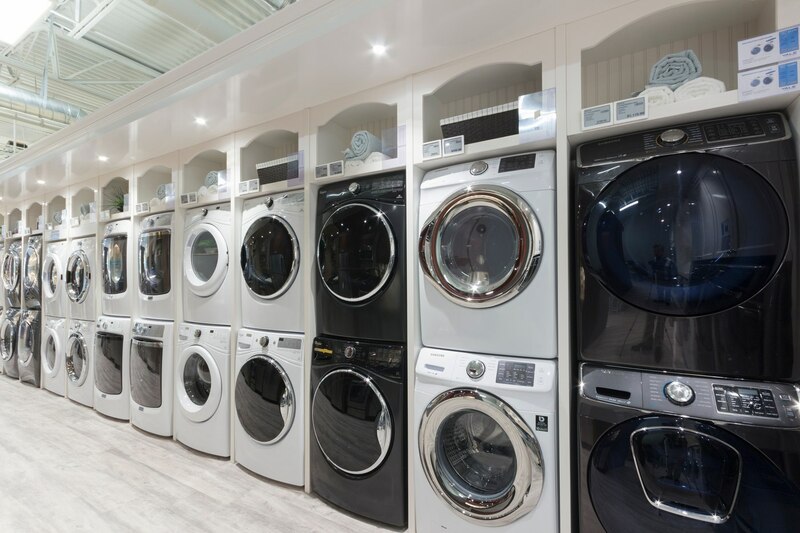 Having the added washing compartment allows for you to have the main wash running and still be able to put a smaller load in simultaneously for a second smaller wash.
On the Samsung, the extra washer is located on the top of the machine. On the LG, the extra washing compartment is an additional piece. This is the pedestal. Normally, a pedestal is a drawer added to the bottom to raise the washer. However, instead of just a drawer, this is a separate washer. The smaller washer is very useful for more delicate clothing because it will be gentler than a normal wash.
6.0 cu. ft. Capacity - Huge capacity because of Samsung's FlexWash system. Self-clean - Easy for service you can identify the issue quickly. Power Foam system - Gives maximum performance for low suds HE detergent. The new Samsung FlexWash can be a life saver in many situations. Whether you are trying to do a quick wash of a few pieces and don’t want to use the main tub, or you are already running a load and forgot to throw a few extra things in. This washer can help in so many ways. You can put all your delicate items in there as well and not have to worry about mixing with other clothes. This is a very versatile unit. If you feel like you do a lot of laundry loads or run into problems of not having enough space, you will love this unit. Direct drive motor – More reliable and smoother wash cycle no belts needed to run the system. Hidden controls – Sleek look hides extra wash space for a more seamless look. Since Clean – Reduces chance for the odor in the drum. 14 Wash Programs – Plenty of wash cycles for any scenario. Compatible with LG Twin Wash – Fits the sidekick pedestal. Stainless Steel Drum – No rust and last longer than porcelain. The new LG sidekick pedestal can give you the extra space you need as well as a gentler wash for delicate times. 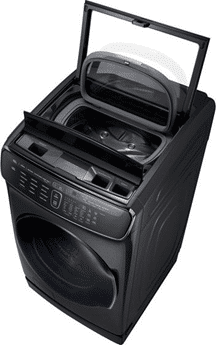 Mind you the sidekick pedestal does not include a washing machine. It will fit on the WM9000HVA which is $1,249.99 washer so for the pair you are looking at $1729.99 this does not include the installation which will be different depending on the current laundry space and hook ups. The washer that this fits on is a bit more expensive than Samsung but does have the same direct drive motor, 14 cycles, and Wi-Fi which you can monitor your wash and will let you know if there is an issue with the system. Looking at both there are some positives to each. For the Samsung, the fact that the appliances are all in one unit makes it much easier to install. Just like the LG, it does have Wi-Fi connectivity for your smart phone, a stainless-steel drum in both washer cavities, and is great for delicate items helping to preserve your clothes for longer. They both can run independently from the main wash which helps in convenience, and the Samsung does have power foam to help clean your clothes efficiently. The LG has one big advantage over Samsung which is the direct drive in the washer motor. It's a much more reliable system that guarantees the same performance on the first run to the 1,000th run since there’s no fear a belt could stretch out in the motor. Personally, I like the Samsung. It has an easy install because it’s all one piece. Plus, it has many of the same features the LG has, such as Wi-Fi connectivity, a stainless-steel drum, the self-clean, and a large capacity. First, the average front load is almost 50% larger to what our parents used 25 years ago. You will have plenty of capacity in just a regular front load for half the price. In other words, you can buy 2 sets of a very decent front load for the price of the Samsung or LG (depending on the dryer). Consider that option unless you truly want to separate a few delicate pieces (or like the Wi-Fi). Download our Yale Laundry Buying Guides with all the features, terms, and brands of laundry. Over 240,000 people have already found answers in a Yale guide.